- It's nine meters down to Chenghua. We are standing next to the Longzhu Pavilion, at Zhushan, the highest point of the former Imperial Porcelain Factory in Jingdezhen. From left to right, Associate research fellow Jiang Jiangxin, Dr Liu Xinyuan, Erik Engel, Professor Bo Gyllensvärd and Jarl Vansvik. Already in the early 1991 I had had the pleasure to visit the city of Jingdezhen. The itinerary that time was more extensive. It had been drawn up by Professor Bo Gyllensvärd together with a number of dedicated friends and collectors of Chinese porcelain to cover a larger part of the Chinese arts history. It had covered a host of places from Neolithic Banpo, Tang Chang'an (Xi'an), Mongol to Qing Beijing and Ming Nanjing, Warlord Shanghai, and then of course Jingdezhen, the historical porcelain capital of China where we looked at the entire porcelain industry, from Five Dynasties to Mao, and the then of course the ongoing excavation of the Ming period Imperial Porcelain Factory. 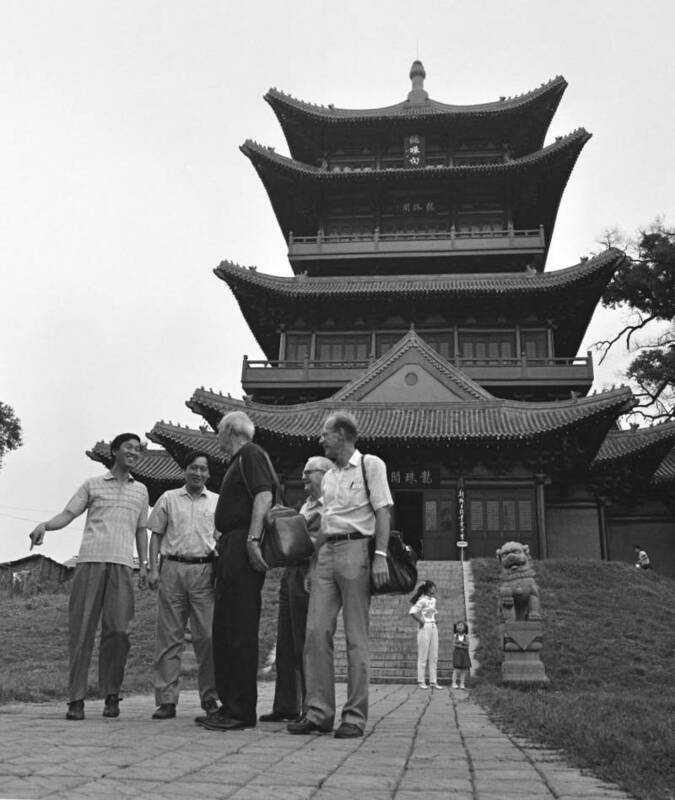 Already then in 1991 we had met with Dr. Liu Xinyuan and his colleagues at the Jingdezhen Porcelain Archeological Research Institute, who were carrying out excavations near Zhushan - the Pearl Hill - which was the actual site of the former Chinese Imperial Porcelain Factory in Jingdezhen. We had also got to see a large number of Imperial Ming porcelain pieces reassembled from excavated shards. The research had brought forth a host of new factual information, and it was felt that we from the Swedish side should try to keep abreast with these new findings. Ideally this would need to be done at the source, by sending a delegation there with the task of studying the recent finds and to eventually report back the new findings to interested parties in Sweden. Well back in Sweden the ball was set in motion to via donations finance a study trip for Professor Gyllensvärd for him to once more make an extended visit to Jingdezhen. At a ceremony in the autumn of 1991 a travel grant was presented. During the 1950s Bo had also studied ancient Chinese porcelain finds in Fostat (old Cairo) and it was felt it also to be a proper opportunity for him to round off these studies by a visit to the very site of their manufacturing. During a seminar at the Percival David Foundation of Chinese Art in London, the 15-17 June 1992 Bo Gyllensvärd and the head archaeologist Dr. Liu Xinyuan met, and the issue of this upcoming visit was brought up. Here Dr. Liu immediately let us know that although he would be traveling most of the time when we planned to be in Jingdezhen, his staff would be there to help us with what we wanted to see. Together with two similarly interested friends and collectors we decided to accompany Bo Gyllensvärd on this study tour, out of our own interest and on our own account. Admittedly it was with somewhat of a surprise that we three months later, after a long and arduous trip, was met by an enthusiastic group of young archaeologists at the Jingdezhen railway station all prepared to show us around and in general be at our disposal. Bo Gyllensvärds own observations from this visit were presented in a talk on Chinese Minyao held in London, in the summer of 1993. The following pages are a number of my photos together with pretty much all my notes taken down during this visit. My intention at that time, was to help document Bo Gyllensvärds own observations in photos and if possibly help document this effort. More than anything I am happy to have got this opportunity to study the ancient porcelain manufacturing traditions at the site of the Imperial Porcelain Factory in such knowledgeable company. It is my hope too that these pages besides contributing to the knowledge of Antique Chinese Porcelain in general will moreover continue Bo Gyllensvärds way of generously sharing his knowledge with anyone interested, a treat that signified his entire scholarly career. By accepting this hospitality we have also entered into a great debt of gratitude to Dr. Liu Xinyuan and his colleagues at the Jingdezhen Porcelain Archeological Research Institute, which it is my hope that we one day will be given the opportunity to reciprocate. This diary translated and published in March 2014.